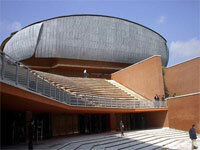 The Auditorium Music Hall in Rome was designed by Renzo Piano, the remarkable Italian architect born in Genoa in 1937. The structure consists of three halls, referred to as "music boxes" by the architect himself. all structurally separated and engineered to insure soundproofing and acoustic precision. Piano designed a curved ceiling with an innovative foresight of having the sound travel along it and not reflect off of it. The calculated risk of his ingenious plan turned out to be a true success. The smallest hall, Sala Petrassi, has a seating capacity of 700 and is equipped with an orchestra pit and fly tower. It was designed to hold baroque concerts, operas, and theatrical productions. The two lateral planes and the stage's raised plane which forms the stage, have been constructed in a modular form allowing them to be completely opened in order to modify its size and therefore used in different forms depending an the event. The medium-sized hall, Sala Sinopoli, holds 1200 people and was designed to host a flexible variety of music functions also due to the flexibility of its seating arrangement and adjustable stage. The halls have been referred to as a number of things, primarily insects, due to the particular shape and materials from which they have been built including red bricks and lead roofing. When construction began on the auditorium, ruins of a 4th century villa were unearthed revealing a wealth of artefacts which brought the project to a halt for two years during excavation. After this remarkable discovery and the time delay due to it, the architect altered his design in order to integrate the findings into his innovative project. Now one can visit the glass enclosed museum, located between the Salas Sinopoli and Santa Cecilia, to view a display of a variety of findings from the excavations. An outdoor amphitheater, with a seating capacity of 3000, joins the group of three halls to host events under the stars. The Auditorium Music Hall also includes two main rehearsal rooms designed with maximum acoustic engineering, serving as recording studios as well. The smaller is used solely for choir practice and the larger room has been designed to hold both choirs and large orchestras. The site of the Auditorium was strategically chosen to accommodate and manage a large number of people who come to participate in events held there. It is located in the city between the Olympic Village, originally built to host the 1960 games, the Palazzetto dello Sport and the Flaminio Stadium on the banks of the Tiber River near the Parioli Hill. It is surrounded by the green of a large park, an extension of the park of Villa Glory, which extends over an area of 30,000 square meters. The Music Park includes a parking structure able to hold up to 700 cars, a selection of eating establishments and beverage stands, and shops for souvenirs.